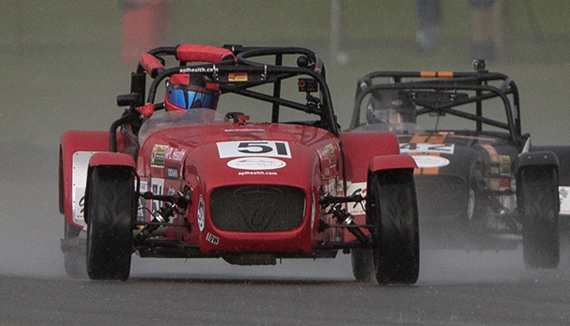 After a solid qualifying, a very wet and windy race one made for a chaotic, and ultimately very unsuccessful race. Starting in 5th and slipping down to 12th was certainly not the plan, and due to a few issues with both the car and the driver, we weren’t able to climb any higher. The second race was far more entertaining, with Torque Motorsport climbing from a starting position of 7th position to the battle for the lead. A closely fought scrap unfortunately ended with some slightly over hostile defending, and our car was launched into the air. We still managed to finish the race in a solid, and very enjoyable sixth position. We go into the final round at Silverstone in fifth place in the championship, a long way off the battle for the championship that we were embroiled in earlier in the year, but still very much enjoying the close racing that the APL Health Caterham Graduates delivers.